Experience the engaging opportunities available by incorporating a mock trial strategy into your classroom. Focus on the roles of juries and how to include juries in a mock trial. Practice other fun strategies you can take with you to build critical thinking and understanding around elements of trials, the powers of juries, and current topics in the American justice system. Model how these strategies build equity, empathy, and civic participation in your classroom community. Have FUN while we learn together! Lunch will be provided, along with other drinks and refreshments during the workshop. Materials will be available digitally and in take home versions at the workshop. 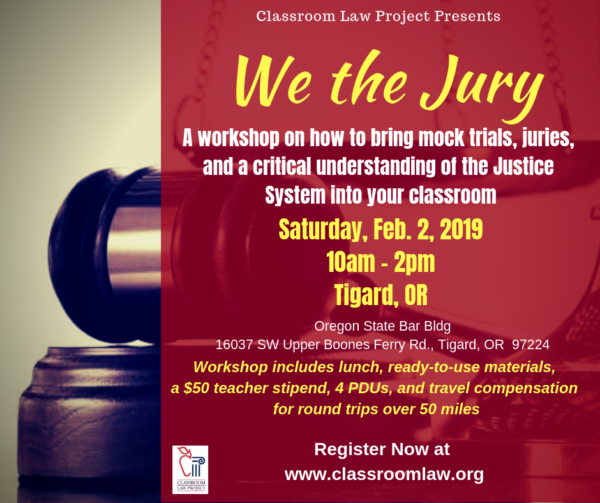 This workshop is made available through generous grants to Classroom Law Project, so while you must pay a reservation fee of $15 to hold your spot, every teacher participant will receive a $50 stipend for attending, and those who travel distances farther than 50 miles round trip will also receive a travel stipend.